Pierre Sterlé may be one of the most important jewelry designers you’ve never heard of. His lyrical, highly engineered creations are some of the most distinctive designs of the 20th Century—and some of the most collectible. But because his business was so exclusive and his clientele so elite, his name isn’t as widely known as some of his contemporaries. At the upstairs atelier he opened in 1943 near the Place Vendôme, he saw socialites and royalty by appointment only. Sterlé manipulated gold like no other jeweler, achieving remarkable fluidity in gemstone birds that appear to fly and leaves that seem to flutter. 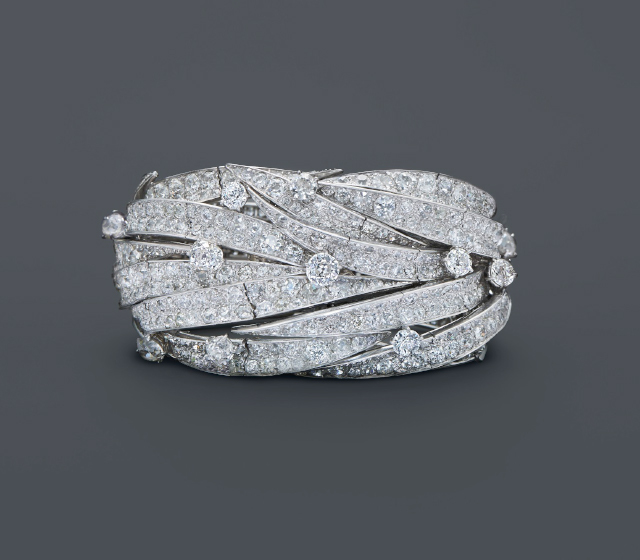 His works from the ’40s and ’50s best demonstrate this mastery, with gold wire weaved and knotted to create the supple strands he called “angel wire.” Sterle’s diamond and platinum jewels are also a triumph of design and engineering, with enchanting ribbons of round and baguette diamonds and swaying diamond tassels. An intriguing asymmetry gives them a sense of movement and the difficult-to-achieve combination of glamour and ease. In 1976, Sterlé sold his business to Chaumet and served as an artistic advisor there until his death. Thus, some of Sterlé’s jewelry from this period is signed Chaumet, although the designs are unquestionably his.